The Huskers had 2 goals this year they wanted to check off their list: 1st beat Texas and 2nd win the Big 12 Championship before leaving for the Big 10. The Huskers' meltdown started when they squandered a 17-0 lead with four turnovers and getting shut out in the second half falling to the Sooners 23-20. Taylor Martinez looked uncomfortable all night and was indecisive and was unable to find his form from early in the season all night. Some will be second questioning the Husker Coaching staff for starting Martinez instead of a healthier Cody Green. After losing their second consecutive Big 12 championship, the Huskers only have a pending bowl game to salvage what is left of their season. The Huskers wait to hear from the Insight or Alamo Bowl to begin to prepare for the last game of the season before beginning a new in the Big 10 conference. Go Big Red! Burkhead had 19 carries for 101 yards, ran for a score and even threw for two touchdown strikes in a 45-17 win over Colorado Friday at Memorial Stadium. 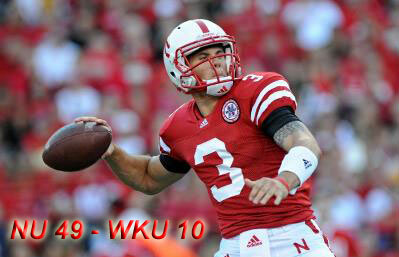 Burkhead was a perfect 2-for-2 passing for 30 yards and 2 touchdowns. The Blackshirt defense also came up big with three second-half turnovers, all leading to short fields and touchdown drives for Nebraska's offense helping the Huskers clinch the Big 12 Conference North Division title at Memorial Stadium. The two interceptions pushed NU's season total to 18 and marked the fifth time this season the defense has had two or more picks in a game. The Big 12 Commissioner Dan Beebe was not in attendance at Friday's game. In fact, the Big 12 had no representatives present to honor Nebraska with a Big 12 North trophy after the Huskers clinched the north title. The Big 12 didn't think it would be safe to send somebody up for the game because of some nasty e-mails that were allegedly received from Nebraska fans. Really? If it wasn't bad enough that the Husker offense turned in another lackluster performance Saturday night in a 9-6 loss at Texas A&M, QB Taylor Martinez who was on his way back from his high ankle sprain reinjured it again early in the game. When Martinez returned, he played with only one good leg and finished 11-of-17 passing for 107 yards with an interception and he carried 11 times for 17 yards. You must give Texas A&M some credit. They were able to keep the Huskers out of the end zone and get the win. Many fans want to blame the refs or believe in a bigger conspiracy within the Big 12. Even head coach Bo Pelini lost his cool on several occasions during the game with the refs and his own player. This was the first time I can ever remember being embarrassed of a Husker head coach. The Huskers have a short week to right this ship before Friday's game against Colorado. 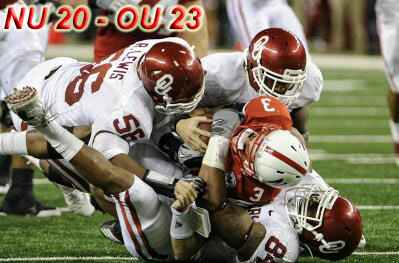 This is a must win game if the Huskers hope to play for the Big 12 title in its final championship game. Turner Gill, the prodigal son, returned to Lincoln this Saturday as head coach of the Kansas Jayhawks. Gill's Jayhawks were just off a remarkable comeback last week with 35 fourth-quarter points to beat Colorado. This win accelerated the firing of Colorado's head coach Dan Hawkins. 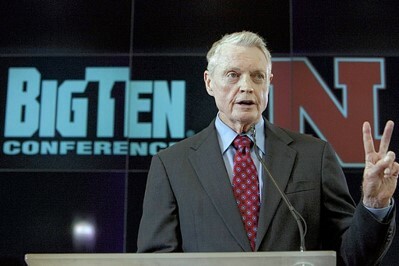 Tom Osborne gave a tribute to Gill, who was his quarterback in the early 1980s and part of the Nebraska "Scoring Explosion" in 1983. 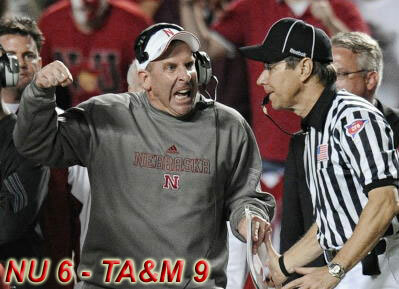 Then Dr. Tom watched Bo Pelini's Blackshirts shut down the Jayhawks in a 20-3 Nebraska victory. Kansas could manage just 47 total yards in the first half, including 32 rushing on 20 attempts. It didn't get much better in the second half, as the Blackshirts held the Jayhawks to just 87 total yards. The Husker offense was adequate at best, but on this night that was enough. It was obvious early on that Taylor Martinez, who missed the Iowa State game last week with an ankle injury, wasn't going to run as much as usual. He had just three carries in the first half, but the Huskers turned him loose a little in the second and he finished with a respectable 76 yards on 11 carries. The Huskers are hoping to have Martinez back to 100% or as close as he can be as they return to the road next weekend as they take on Texas A&M. Husker Nation let loose a big sigh of relief when Eric Hagg intercepted a floating pass by Iowa State holder Daniel Kuehl on a fake conversion kick in overtime as Nebraska beat Iowa State 31-30 Saturday. With Taylor Martinez and Zac Lee out, Nebraska turned to Cody Green, who started two games in 2009 but had played sparingly this season. The Huskers didn't seem to trust Green throwing the ball in the first half as they ran on 24 of 28 plays. Rex Burkhead kept Nebraska in the game running the wildcat offense during key moments of the game. Burkhead ran for 129 yards and two touchdowns with the most important being a 19-yard touchdown to start overtime. Nebraska's departure to the Big Ten in 2011 likely means the Huskers won't face Iowa State unless the pair meets up in a bowl or a nonconference game. The Huskers have anther week for their quarterbacks to heal before Kansas travels to Lincoln next Saturday night. Roy Helu Jr. had the biggest game of his career rushing for a school record 307 yards as No. 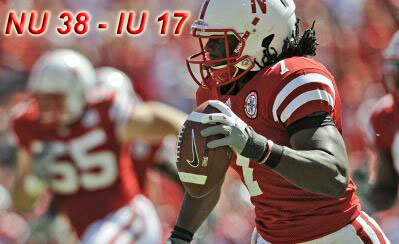 14 Nebraska knocked Missouri from the ranks of the unbeatens with a 31-17 victory Saturday. Helu ran for 3 touchdowns during the game from 66, 73 and then 53 yards. Taylor Martinez was unable to play in the second half after he came up hobbling following a hit late in the second quarter. Coach Bo Pelini said Martinez had a bruised right leg and should be able to play next week at Iowa State. Nebraska keeps finding ways to win as they held off Missouri after building a 24-0 lead in the first half and moved into a first-place tie with the Tigers in the Big 12 North. 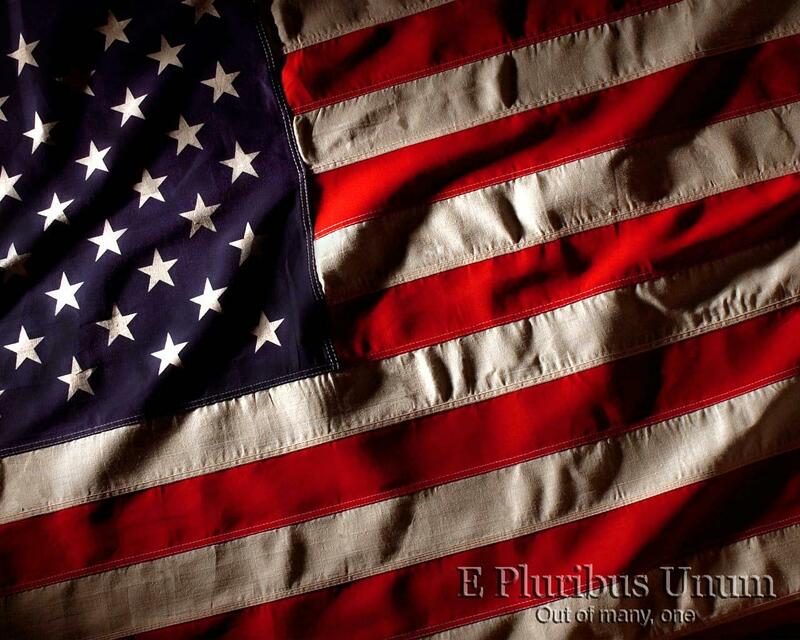 Nebraska holds the tie breaker with today�s victory. Nebraska and Missouri have played 89 straight years. The series has now ended with Nebraska joining the Big Ten next year. Nebraska travels to Iowa next weekend to play Iowa State. Taylor Martinez bounced back from a poor outing against Texas last week to hand Oklahoma St its first loss this year 51 to 41. Martinez set yet another freshman record, this time throwing for 323 yards and 5 touchdown passes with no interceptions. Brandon Kinnie not only caught his first career touchdown, he then proceeded to catch the next 2. Niles Paul also bounced back with a career-high 131 yards receiving and Nebraska's first 100-yard kickoff return for a score since 1949. The Blackshirts hadn't given up more than 21 points in 14 straight games. This was the longest streak in the nation before Oklahoma State scored 27 in the first half. The Blackshirts will have to get that fixed before a very tough Missouri team comes to Lincoln next weekend. The Huskers come up empty with their final bid to beat the Longhorns. The Longhorns outplayed the Huskers and shut down freshman sensation Taylor Martinez on their way to a 20-13 victory. The Longhorns did enough to win the game while the Huskers were dropping passes all over the field. Rex Burkhead, Niles Paul and Brandon Kinnie all dropped a sure touchdown pass. There were at least three dropped touchdown passes and maybe even more. It's an important thing now for the Huskers to put this game behind them. The Big 12 North is still out there for the taking. Win the Big 12 North, and then you have a chance to win the Big 12 title. Now if the Huskers want to beat the Longhorns before departing to the Big Ten, they will have to root for the Longhorns to win the South division then possibly a rematch in the final Big 12 Championship game. 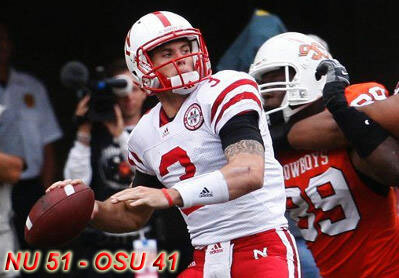 Husker fans need to be very careful about what they wish for. Nebraska quarterback Taylor Martinez rushed for 242 yards and four touchdowns as the seventh-ranked Cornhuskers ended a 99-year rivalry with Kansas State 48 - 13. Martinez produced the best rushing performance by a quarterback in Nebraska football history which is saying a lot considering to the company he is in following great rushing quarterback like Crouch and Frasier. And for good measure, he connected with Kyler Reed on a 79-yard touchdown pass. Martinez hits the seams in the defense like a sprinter and gets to second gear in a hurry. Plus, he took on tacklers and pick up extra yards after contact. Denard who? With this strong performance on Thursday night with the nation watching, the Husker forced their way into the national championship discussion. Only time will tell but for the Huskers all focus now turns to the Texas Longhorns as the Husker prepare for what many Nebraska fans have waiting a season for. The Blackshirts were the key for the Huskers 17 to 3 victory over South Dakota State. In a game where the Huskers were favored by several touchdowns, the Husker offense was average at best. Taylor Martinez played like a freshman tonight with 75 rushing yards on 13 carries, while completing only 6-of-14 passes for 140 yards and one touchdown. He also threw two interceptions. The running game never really got going with Rex Burkhead rushing for 66 yards on 14 carries and Roy Helu Jr. gained 59 yards on 19 carries. 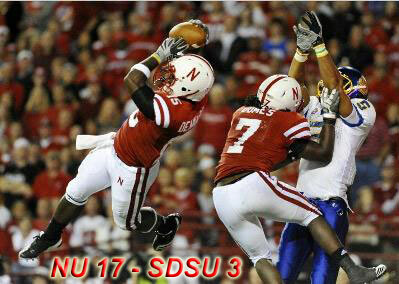 The Blackshirt defense did, however, hold up their end of the bargain holding South Dakota State to only 3 points. The Huskers still have a lot of work to put in before they begin Big 12 play. The good news is that they have 12 days to prepare. The Huskers will travel to Manhattan Kansas next to play Kansas State in a nationally televised game on ESPN's Thursday night college football. The Huskers win impressively on the road against the Washington Huskies 56-21 led by freshman quarterback Taylor Martinez. Martinez rushed for more than 100 yards for the 3rd straight game and joins Heisman Trophy winner Eric Crouch as the second quarterback in Husker history to ever do so. After today's performance, Martinez moves into the number 8 spot on the Husker's all time freshman season rushing list just ahead of Tommie Frazier. Martinez was 7 of 11 passing for 150 yards including a 24 yard touchdown pass to Mike McNeill for the game's opening score. The Blackshirt defense also got into the act with Alfonzo Dennard intercepting a Jake Locker pass for a 31 yard touchdown. The Blackshirts gave up only 246 total yards and just 71 yards passing for the game. The Blackshirts' nation leading streak of 14 games of holding its opponents to 20 points or fewer has now ended. Taylor Martinez had another solid outing rushing for 157 yards and 2 touchdowns as the sixth-ranked Cornhuskers defeated Idaho 38-17 on Saturday. The offense was productive, but mistake-prone in the second half, which was a red flag to Coach Pelini, whose team faces a major road test next Saturday at Washington. The Blackshirts defense carried the day intercepting Nathan Enderle five times, and recording seven sacks against the Vandals. Nebraska's Rickey Thenarse (47 yards) and Dejon Gomes (40 yards) both had interception returns for a touchdown. This was the fifth time in school history Nebraska has returned two interceptions for a touchdown in the same game.